Lex Luthor reinforces a building damaged during the fight with Doomsday as the obviously powerless Clark Kent joins him. They watch as a Superwoman saves a mother and child and then discover the ship that was carrying Doomsday. Upstate Wonder Woman continues her battle with Doomsday and is kicked in the face for her troubles. Superman gets back into the fight but neither hero can get the upper hand. Jonathan lashes out at Doomsday with his heat vision but that only angers the creature. Superman knocks Doomsday out of the immediate area and has Wonder Woman take Jonathan and Lois to the Watchtower so that they will be safe. The mysterious Mr. Oz finally sends his men in to help with Doomsday and they converge on the creature. Superman watches and realizes that their involvement signals that there is something bigger at play. Story - 5: It could be argued that things are getting a little repetitive in this story. Superman and Doomsday fight. They stop fighting. Superman talks to his family. The fight begins again. Short scenes with Lex and the other Clark mixed in for good measure. The thing is I can't bring myself to come down hard on this story especially when you consider that it's paying homage to the original DOOMSDAY storyline, which stretched over seven comics and had the same fighting/not fighting so Superman can deal with something/fighting/brief shots of the supporting characters going through their motions that this story has. It would be disingenuous to do that so I won't. The banter between Lex and Clark at the beginning of the issue eased us back into the story. I appreciated the brief "cameo" of Superwoman as it ties the new Super Title into this one, which was something I felt was missing from the majority of the New 52. The Doomsday fight continues to be brutal but more importantly interesting. Doomsday using Wonder Woman's lasso to strangle Superman shows a cunning that the original Doomsday had and lets you know this isn't a mindless beast on a rampage. Jonathan using his heat vision made for a great action and character beat especially later on when he begs his father to let him help in the fight. The "whatever happens I'll always love you" homage from the original DOOMSDAY story was not only a nice call back to the original but an organic moment within this story. I loved that Superman trusted Wonder Woman to keep his family safe and even though I have seen the solicitations and am pretty sure that Superman is going to survive his battle with Doomsday there was a lot of drama packed into him promising to be back. The final moments of the issue did a great job to set up the conclusion to this story and ended on a note designed to make the reader want to come back to find out how these shadowy figures play into the conclusion. All in all, this was another great issue. 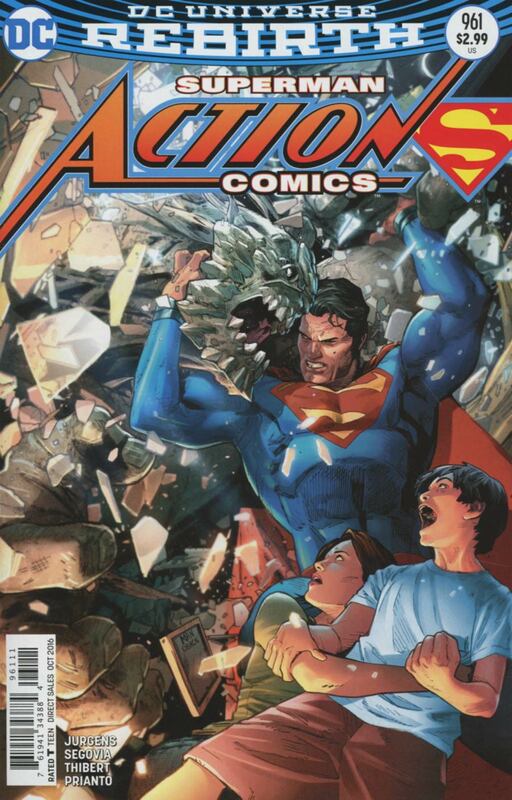 ACTION COMICS has yet to disappoint and things seem to be back on track. I know that REBIRTH (or at least the main mystery/story around REBIRTH) is slated to last two years and that in 2018 we could be dealing with a whole new paradigm which means that this warm and fuzzy feeling these books have been giving me might be short lived. For the moment I am just going to enjoy myself and be happy that I am getting a line of great Superman related comics to read week after week. Art - 4: While there were a few panels here and there where the detail seemed to drop out a bit (the shot of Lex on the first page is a good example of this) the artwork in ACTION COMICS continues to be fantastic. Segovia's style is different from Patrick Zircher or Tyler Kirkham but it still feels like it belongs in the same story. It did my Post-Crisis heart good to see Art Thibert's inks on this issue as he and Dan Jurgens have some history together with Superman. The action (no pun intended) is intense and some scenes (like the one where Doomsday grabs Superman by the face and slams said face into the ground) are just brutal. The fake-out with Jonathan using his heat vision was well played as was the homage to the scene in SUPERMAN #75 where Superman says goodbye to Lois before going off to fight Doomsday. Once again the art compliments the writing and gives us the entire comic book experience. Cover Art - 5: This cover has a great horror movie poster feel to it. Superman looks heroic as he battles Doomsday while Lois and a screaming Jonathan freak out about the fight taking place before them. I like that it's Jonathan doing the screaming and not Lois because that plays against type. 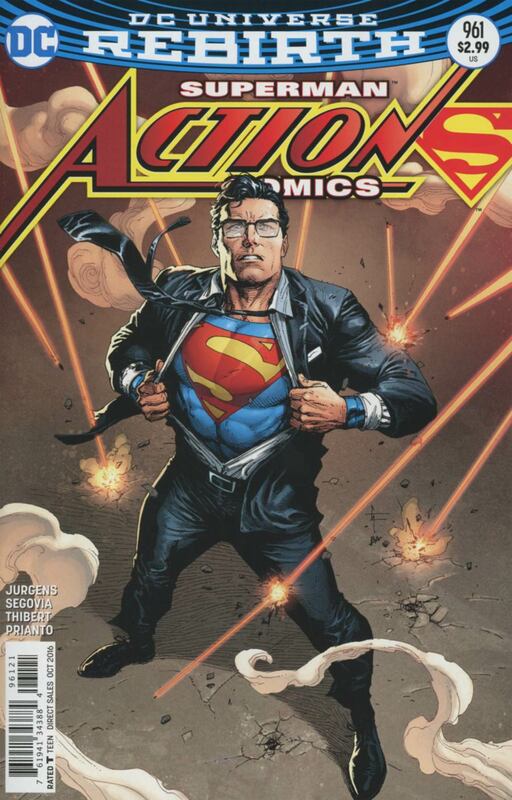 The one constant in just about all of these Rebirth ACTION COMICS covers is how Superman is rarely shown from the waist down. He was on the first cover but for the most part the images focus on his chest and cape. There is a part of me that wonders if they are going for that because the covers would then feature a more iconic looking Superman. Outside of the little wrist things the costume upper half of the costume hasn't changed much. I'm not saying there is a conspiracy afoot but I was curious if they were avoiding the bottom half of the costume on the covers to give them a more traditional feel. Variant Cover Art - 5: This cover stopped me dead in my tracks at the comic shop. For the past few issues we've been treated to some darker themes in the variant covers. This one is truly iconic and looks amazing. It's almost hard to write about because the image hit me so hard.